On behalf of Leighton Middle School, I am delighted to welcome you to our website. I am fortunate to lead a team of loyal and dedicated staff who all want to do their best for your children. We are a happy and successful school where we seek to value every individual. I will continue to strive to promote personal excellence and well-being and uphold our high academic, teaching and pastoral standards. Here at Leighton Middle, we are passionate about promoting and safeguarding the welfare of all our children and are committed to providing a welcoming community atmosphere in which we can nurture the achievements of every child. Academic achievements are highly valued and closely monitored to ensure all our pupils reach their potential. We recognise the importance of a broad and balanced education and we promote opportunities outside the classroom, celebrating and recognising talents and achievements enabling all our children to grow in confidence, develop a sense of responsibility and achieve personal ambitions. We believe it is important to develop confident and considerate individuals who are aware of their role within the wider community and beyond. We seek to create a community of children and staff who are reflective of their actions and are considerate of others irrespective of background, culture or viewpoint. We are able to offer our pupils a wide range of opportunities due the excellent facilities and experiences we provide. The school has a purpose built hub for Year 5, which opened in 2017, and specialist rooms for Art, Design Technology, Food Fabric Technology, Science, Music, ICT and PE. All rooms are equipped with interactive whiteboards linked to a PC and have internet access. 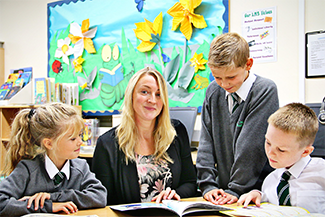 There is a well-stocked and well used library that children are encouraged to use, and do so regularly, supporting our whole school ethos of encouraging all children to read frequently. The school has extensive playing fields for use at lunchtimes (weather dependent) and for PE lessons. Above all, we strive to ensure equality of opportunity for all and to provide an exciting, engaging and challenging experience for our pupils in a safe, supportive and happy environment that enables them to reach personal excellence. However, this is only possible when we work together with parents, carers and families to build a network of support. I truly believe, that when we work together, powerful things can happen and children reap the benefits. Within our website, you can find details of all aspects of our school, which I hope are helpful and informative. The staff, children and governors are all extremely proud of Leighton Middle School and are always pleased to show current or prospective parents around so that you can see for yourself what we have to offer your children. To find out more, please do contact us. Thank you for taking the time to find out about us.